[New for early 2015] So Nick and I have already spied a few new skinny cow treats, but we were more interested in trying Talenti or B&J or H-D.... but let's see if we can't lighten things up a bit and try one of their new treats. Plain white wrapper removed, it's time for a taste test. On Second Scoop: It's been two weeks now and I finally tried this one again. Well, forced myself to try it anyway. I really don't know why I don't like this one. It's not that it tastes awful, there's just something about it that makes my brain refuse to review it. If you've tried this, please leave a comment to help me work through my thoughts (and the rest of this box). Update: It's June and these are still in my freezer, so like any good parent, I pawned one off on my daughter... and she actually liked it. I almost feel like I should try another one... .if only I could get in the mood for one. It's not just you, these were funky tasting. I usually like Skinny Cow but these were just wrong somehow. So not worth 180 calories not to mention the price. Gonna disagree with you on this one. 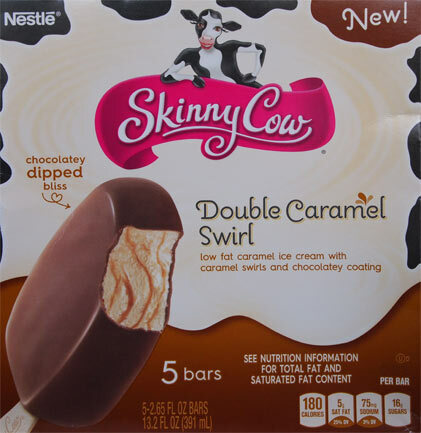 I love Skinny Cow ice cream. I got hooked on it when I first started dieting, and have enjoyed a bar practically daily for the past five months while still loosing weight - Unpaid endorsement. With that said, it's funny that you reviewed this one because I actually tried it for the first time last night. I thought it was really good. The caramel came through, and the chocolate shell was "icing on the cake". Loved every bit of it. It was rich, creamy, and just delicious. @Anon: thanks, I feel better now! @TTB: I will not argue that the caramel definitely comes through. It's hard to quantify what was bugging me. @TTB: Ha, maybe, but I've made it through some of their other products just fine. Whatever is bugging me, it's fairly subtle.